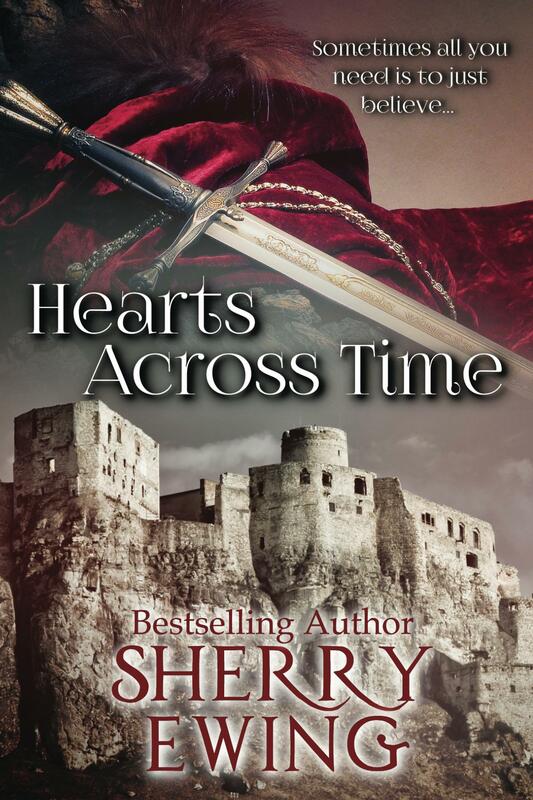 On today’s First Kiss Friday, I’d like to give you an excerpt from my medieval time travel, For All of Ever (which is also in the box set Hearts Across Time). In this scene, Riorden has just “rescued” Katherine after she was skinny dipping with her friends in a pond. Happy reading and enjoy their first kiss. The smile she gave him disarmed him to his very core. Afore common sense could prevail, he grabbed her about her waist and brought them chest to chest. She gasped as they made contact, skin to skin. She lovingly wound her arms around his neck. He swore she gave him the most seductive purr he had ever heard in his entire life. ’Twas most pleasing to his ears. “Do you feel it, Riorden?” she asked huskily. He gave a brief laugh, since he certainly felt all kinds of sensations, especially a part of him rising to the occasion. “What?” he asked. He easily held her with one arm whilst his free hand moved a stray lock of wet hair from her face. “Your heartbeat next to mine,” Katherine whispered, ever so softly. He was momentarily startled at her words until the reality of them hit him full force. They were actually his own words spoken from his heart when they were both nothing more than shadows of what might have been. It humbled him whilst he did indeed feel her steady heartbeat next to his own. They were no longer ghosts, but flesh and blood. She had crossed time for him, and he vowed he would keep her forever by his side. “Aye, my dearest Katherine, I feel it, too,” he replied profoundly, and watched in fascination whilst the pulse at her throat ticked rapidly. He was pleased to know he had such an effect on her, since the same held true of him. He felt her clasp her arms around his neck more fully as she molded her body to his own. It was almost his undoing. “Isn’t it wonderful when dreams come true,” she added whilst she began to trace the planes of his face. “Will you do me a favor?” Katherine asked timidly. “Aye.” He did not trust himself with an attempt at a longer response whilst she looked at him with those scorching aquamarine eyes. His resolve to remain a gentleman vanished abruptly with her plea. His head swooped down and his mouth took possession of hers in a ravenous kiss. ’Twas as if he was starving, and only she could satisfy his hunger. His tongue plunged into her mouth and danced in tune with hers. He moaned at the contact. She moaned in response. His hands roamed down her backside and brought her closer, if that was at all humanly possible. He felt every glorious inch of her and knew in his heart he had found his soul mate. She was the other half of him, making him complete. She was what he had always been missing in his life. She was perfect for him, and she was his. He deepened their kiss and felt as if time no longer had meaning to them. Time. He vowed Time would not steal her back and take her from his life. He broke their kiss. She took his lower lip and gave it a small nibble. Merde! Where did she learn to be such a seductress? He reluctantly began to lower her back down the length of him, never taking his eyes from hers. He could tell by the look she gave him, she was disappointed. Wondering what she would do next, he had to remember to inhale when she surprised him by reaching out her hands to place them on his chest. He gave a sharp intake of breath as air rushed into his lungs whilst her fingers began to slowly explore his muscles, moving ever downward on his stomach. “My God. You must be the most beautiful man I’ve ever seen,” she murmured in awe, biting her lower lip. ’Twas taking everything within him not to smother that deli-cious mouth of hers in another searing kiss. “A man cannot be called beautiful, my lady,” Riorden managed to choke out. Katherine stopped her fingertips and laid her palms fully upon him. He sucked in his breath yet again, when she leveled her ex-quisite bluish-green eyes on him. “Oh, but you are…” Her words trailed off and hovered between them. She gave a tiny smile that could only be termed intimate before she continued touching him. Centuries are keeping them apart until Time gives them a chance at finding love. But there are obstacles threatening the fragile bit of hope that Riorden and Katherine can remain together. Will the past of one consume what their future may hold, or will Time take the decision from them and hurtle Katherine forward to where she truly belongs? Read it for FREE in Kindle Unlimited! For All of Ever is also a part of a special box set entitled Hearts Across Time. It has Katherine and Riorden’s complete journey that includes Only For You. For links, see my book tab above.